Moving Averages are important indicators in Technical Analysis.Traders may use Moving Averages as a signal to take their trading calls or identify the prevailing trend in the stock markets whether it is an uptrend or downtrend. You can use Moving Averages for any time period depending upon your trading or investing requirement.For example,long term investors use 200 day Moving Average to see the trend and bullishness in a stock.Likewise short term traders may use 5 day,20 day or 50 day or any time period Moving Averages for their trading purposes. By definition,the Moving Averages are the mathematical average of a number of values,the number is the time period for which you want to calculate Moving Average.For 20 day period,it is the average of prices of a stock for the last 20 days.It is the closing price of a trading session for a stock that is chosen to calculate Moving Averages.Closing price represents the trader’s psychology better than opening price or highs and lows of the stock on that trading day. 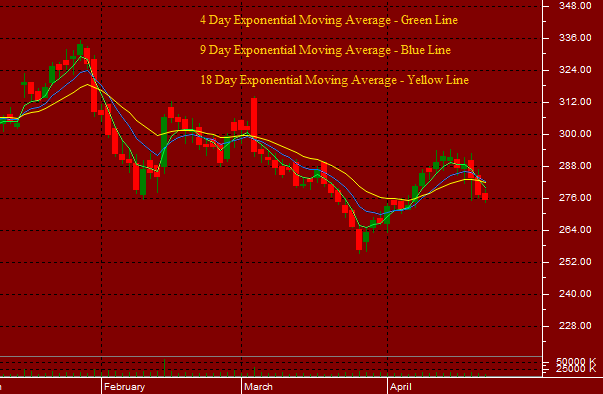 The Moving Averages are called as Moving because everyday we include the last trading session’s closing price for calculations while leaving the last trading session price.Suppose,we want 10 day Moving Average for a stock on April 11,we take closing prices from April 1 to April 10 of that stock.If we want 10 day Moving Average on April 12,we use values from April 2 to April 11.April 1 value gets excluded.So the average keeps on moving. We don’t need to actually calculate the Moving Averages by ourselves.Trading software do it automatically,you just enter the time period for which you want the Moving Average. The major drawback of Moving Averages is that they are lagging indicators.A lagging indicator is one which generates Buy or Sell signal after the up or down move in a stock or stock market has started.So it is likely that you miss the initial move in the stock prices. This is in contrast to leading indicators which generate Buy and Sell signals before the move starts in the stocks.This enables you to catch all the move which is about to happen in that stock.But the probability of leading indicators going wrong is higher than the lagging indicators.Relative Strength Index (RSI) and Stochastic Oscillator are the leading technical indicators. Simple Moving Average – The Simple Moving Average is the simple arithmetic mean of the values.It gives equal weightage to every value while calculating the Moving Average.That was the reason for its criticism among a section of traders. Those people believe that more weightage should be given to the more recent closing prices of stocks because they are more relevant. Exponential Moving Average – To deal with the criticism of Simple Moving Average,Exponential Moving Average was devised.It is the logarithmic average of the values.It gives more weightage to the most recent closing prices while calculating the Moving Averages.Exponential Moving Average gives more smooth results than Simple Moving Average. Moving Average are the technical indicators.There are traders who use Moving Averages to find Buy or Sell signals for initiating a trade.Reliability of Moving Averages depends upon the time period selected for calculating the Moving Average. Short period Moving Averages generate quick signals but the probability of going these signals wrong is more.Long period Moving Averages take time to generate trading signals but they are likely to be more accurate.So a 5 day Moving Average generates quick signals as compared to 20 day Moving Average but the reliability of later is more. When the prices move and close below a specific period Moving Average,a Sell signal is generated.When the prices move above the Moving Average,Buy signal is generated. 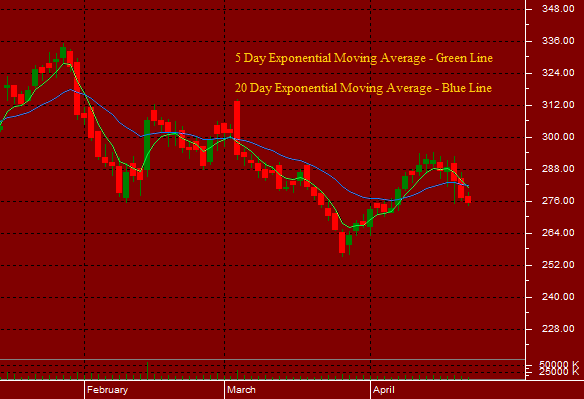 To get more reliable Buy or Sell signals,we may use Moving Averages Crossovers.These crossovers are created by drawing Moving Averages for 2 or 3 time periods for a stock.Most popular Crossovers are for 5 day and 20 day period Moving Average Crossovers and 10 day with 50 day period Moving Average Crossovers. A Buy Signal is generated when shorter period Moving Average crosses above the longer period Moving Average.For a 5 and 20 day Moving Averages Crossover when 5 day Moving Average crosses above the 20 day Moving Average,a Buy signal is created. 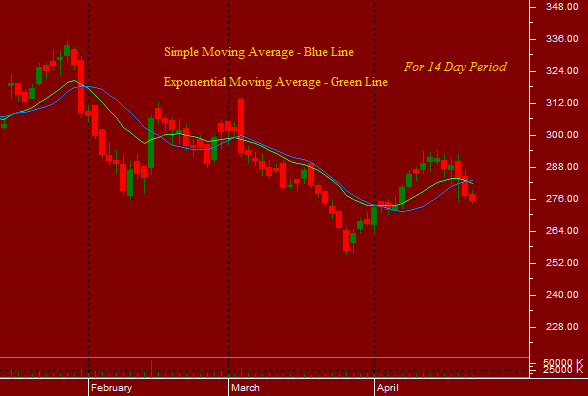 A Sell Signal is generated when shorter period Moving Average crosses below the longer period Moving Average. You may use Triple Crossovers with 4 day,9 day and 18 day period Moving Averages to get more precise and reliable Buy and Sell signals.A Buy signal is generated when 4 day Moving Average crosses above 9 day Moving Average.The Buy signal is confirmed when 9 day Moving Average also crosses above 18 day Moving Average.A Sell signal is generated when these Moving Averages cross lower.